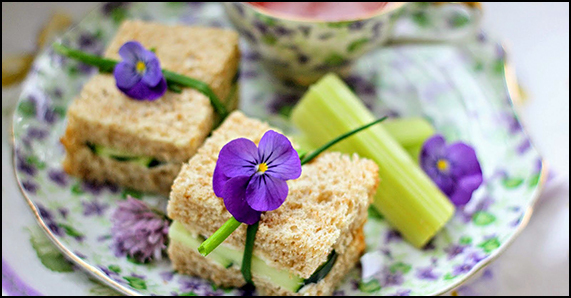 Afternoon tea was created by Anna, the Seventh Duchess of Bedford, in the year 1840 as a way to quell the envitable hunger pangs between lunch and dinner. This ritual became so popular among affluent classes that it became one of the mainstays of the British way of life. Prior to the introduction of tea into Britain, the English had two main meals, breakfast and dinner. Breakfast was ale, bread, and beef. During the middle of the eighteenth century, dinner for the upper and middle classes had shifted from noontime to an evening meal that was served at a fashionable late hour. Dinner was a long, massive meal at the end of the day. Tea was initially served between three and four o’clock. It was normally taken in the gardens, dining room, or parlor. The household’s finest china, sterling and linens were utilized in carrying out this ritual. The menu normally included tea sandwiches, cakes, scones, cookies, and assorted pastries and of course, Devonshire cream. 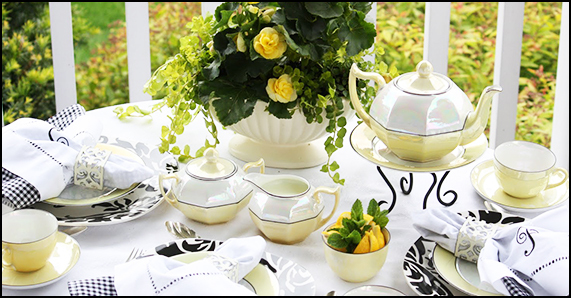 As the tea tradition expanded from the Victorian elite to the working class, the High Tea was developed. 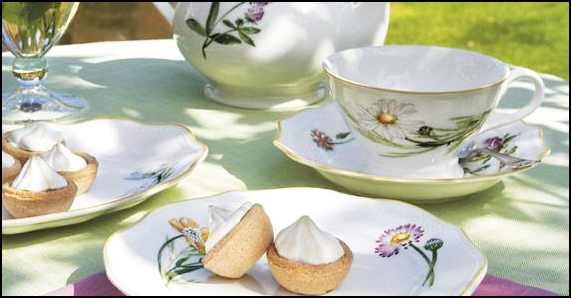 High Tea was a combination of afternoon tea and the evening supper; the tradition soon became the main meal for many. The name comes from the fact that the tea was taken at the high time of day, four to five o’clock and it was enjoyed from high stools in the tea shops or standing; at a corner stall, a buffet table or a counter. Anna, the Duchess of Bedford (1788-1861) is credited as the creator of teatime. Because the noon meal had become skimpier, the Duchess suffered from "a sinking feeling" at about four o'clock in the afternoon. At first the Duchess had her servants sneak her a pot of tea and a few breadstuffs. 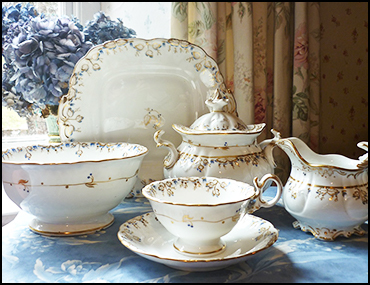 Adopting the European tea service format, she invited friends to join her for an additional afternoon meal at five o'clock in her rooms at Belvoir Castle. The menu centered around small cakes, bread and butter sandwiches, assorted sweets, and, of course, tea. This summer practice proved so popular, the Duchess continued it when she returned to London, sending cards to her friends asking them to join her for "tea and a walking the fields." The practice of inviting friends to come for tea in the afternoon was quickly picked up by other social hostesses. During the second half of the Victorian Period, known as the Industrial Revolution, working families would return home tired and exhausted. The table would be set with any manner of meats, bread, butter, pickles, cheese and tea. None of the dainty finger sandwiches, scones and pastries of afternoon tea would have been on the menu. Because it was eaten at a high, dining table rather than the low tea tables, the term "high" tea remained although its definition slightly changed. 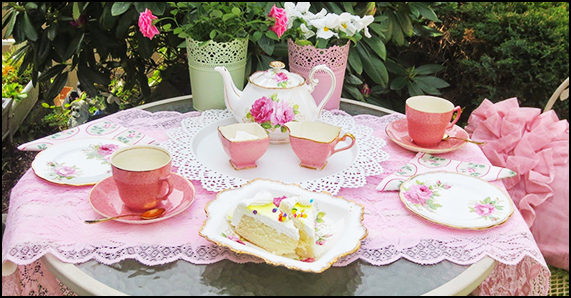 At this year's Victorian Days you will have the opportunity to enjoy a Victorian Porch or Garden Tea in historic Belvidere, New Jersey. Your host will provide a variety of dainty finger sandwiches, scones and pastries to complement and enhance your experience. Your host will provide a variety of dainty finger sandwiches, scones and pastries to complement and enhance your experience. A ticket is required in order to enjoy the time-honored tradition of Victorian Porch & Garden Teas. Select the date, time and location of your choosing from the available options below. Although online ticket sales for these teas have ended, there are still tickets available. Please visit our TICKET TENT during Victorian Days to purchase a Porch or Garden Tea Ticket for $30 per person. Your host will provide a variety of dainty finger sandwiches, scones and pastries to complement and enhance your experience. Following your tea, your host will take you on a guided tour of their home. A ticket is required in order to enjoy this spectacular tea and tour combo. Select the date, time and location of your choosing from the available options below. Although online ticket sales for the Hadrava Tea & Tour Combination have ended, there are still tickets available. Please visit our TICKET TENT during Victorian Days to purchase a Hadrava Tea & Tour Combination Ticket for $45 per person. 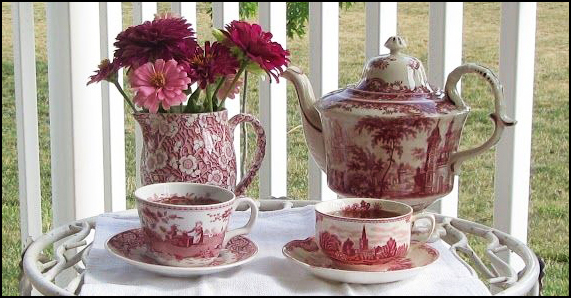 Please submit a completed form if you would like to host a Victorian porch or garden tea. 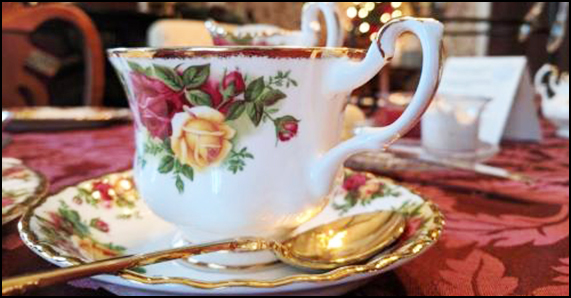 You may use the links below for helpful tips, tricks, recipes and inspiration so you can host an exceptional and quaint Victorian Tea at Belvidere's next Victorian Days. If you're not ready to host a porch or garden tea, perhaps you will consider hosting a Victorian or Historic House Tour. You may also host both. Many thanks to our friends at All Things Victorian for some of the informational content on this page. Belvidere Heritage, Inc. exists to promote an interest in local and period history.